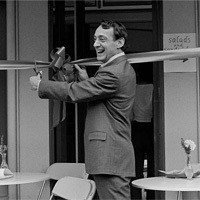 After serving almost eleven months as a San Francisco supervisor, Harvey Milk was assassinated in 1978 along with the city’s mayor George Moscone. He didn’t hold the highest profile government job, but as the first openly gay person to be elected to public office he made national headlines. Milk couldn’t have known that his life would be honored with an Academy Award-winning documentary, The Times of Harvey Milk. Or that Sean Penn would win his second Oscar for portraying him in Gus Van Sant’s Milk. Nor could he have imagined that a one-hour oratorio, a large musical work for voices and orchestra, would be written about him and performed around the country. Broadway composer Andrew Lippa (The Wild Party, Big Fish, The Addams Family) has written I Am Harvey Milk and will sing the main role in two performances with the Gay Men’s Chorus of Los Angeles this weekend at Walt Disney Concert Hall.